ASUCR held its eighth meeting of the quarter at 6:34 p.m. last Wednesday, Nov. 14. Justin Domecillo, a fourth-year English major, spoke during public forum about the issues that UCR students and other groups have found with the planned establishment of a Riverside University School District (RUSD) STEM high school on UCR grounds. The first issue he touched upon was that of sexual harassment involving the students that would attend the school. “Who’s responsible for Title IX?” Domecillo asked, discussing the risks of a bad image that such incidents would create. After Domecillo stepped down from the podium, Rich Davis, Assistant Principal at RUSD’s John W. North High School and representative of the committee that passed the decision to build the STEM high school, stepped up after reading about the matter in the Highlander Newspaper. He reported that three community meetings have been held between both UCR students and people in the community to discuss the STEM school. Davis indicated that he was “extremely impressed” with the number of students that showed up to them. ASUCR President Semi Cole gave his thanks to Davis for showing up to the ASUCR meeting, and the senators then asked Davis questions about the matter. 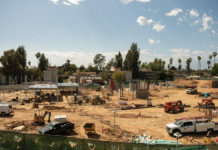 It was asked whether any organizations were actively fighting the establishment of the STEM school, and Davis responded that there is currently a lawsuit going on between the surrounding community and the UCR administration concerning future buildings like the school. Davis also pointed out that “students had no idea (the building of the STEM school) was happening” in the past. 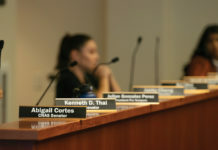 Domecillo commented further upon the lack of awareness for the school among students, pointing out that Chancellor Kim A. Wilcox already signed the paperwork for the STEM high school to be built in September 2015. Domecillo stated that “doing so was a direct violation of the principles of UCR,” in this case the transparency of UCR administrative activity. The issue of parking for high school was also brought up by Domecillo, stating that no parking has currently been allocated to accommodate the new students, adding that the only place that commuters could park is the neighborhood. After Davis finished, the meeting moved to the approval of the Elections Committee. The vote was passed 14-0-2 and discussion continued with senate reports. 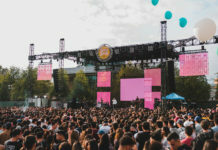 Senator Abigail Cortes mentioned that she is working with Transportation and Parking Services (TAPS) and the UC Police Department (UCPD) to further discuss how UCR ought to respond to shooting threats and similar incidents, due to the expressed discontent of ASUCR to the response of UCPD to the AI shooting rumor. The meeting concluded at 7:19 p.m. with no new business. ASUCR meets every Wednesday at 6:30 p.m. inside of HUB 265.